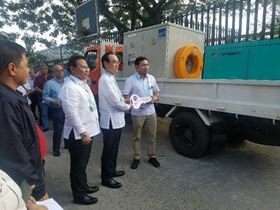 Ebara Corp has delivered eight pump trucks for emergency drainage in the Philippines. The drainage pump trucks are equipped with ultra-lightweight Ebara pumps, a hose, an operation panel and a generator. The trucks can rush to flooded areas and start draining immediately, with only a small number of people involved. They are particularly useful in the early recovery of flood-damaged areas and in flood damage prevention when a river rises. Along with the drainage pump trucks, Ebara also sent supervisors to provide training. Demand for flood control is increasing in Southeast Asia, and early recovery from flood damage is now a major issue. Drainage pump trucks equipped with Ebara pumps have also been delivered to Laos and Vietnam in Southeast Asia. The Japanese company says that it will continue to contribute to the development of Southeast Asian countries through the provision of products and services, including pumps, that meet local needs. The pump seminar took place at the Ebara Vietnam Pump Co Ltd plant in Hai Duong Province, Vietnam. Fifty two people attended the pump seminars that Ebara Corp held in Bangkok from 30 August to 5 September 2018. Ebara Pumps Europe SpA moves pump production from Brendola to a new, larger facility in Gambellara. The Ebara submersible motor pump has a 1000 mm-bore.